Join The Mary Baker Eddy Library and the other institutions forming the Fenway Cultural District, as we open our doors! Together we’re sharing the exciting creative work of neighborhood artists, musicians, and cultural institutions. Begin at 10:00 a.m. with a kick-off and parade on the Plaza. 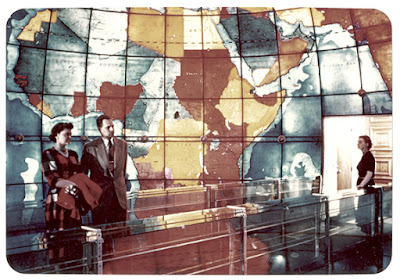 Then visit the Library and step back in time to 1935—and the day the Mapparium first opened its doors. Meet architect Chester Lindsay Churchill, played by Daniel Berger-Jones of Cambridge Historical Tours, as he talks about this three-story, stained-glass masterpiece and strolls around the building that houses it. Then immerse yourself in the 1930s, through lindy hop dance performances by the Lindy Bomb Squad, a vintage film, crafting of the era, and much more. 1930’s inspired garb is encouraged, but not required! An Art Deco-inspired Architect’s Reception, catered by High Tea Caterers, will take place at noon. Seating is limited and reservations are recommended. Library admission will be free all day to the world-famous Mapparium and inspiring Hall of Ideas, as well as all our interactive exhibits. And don’t forget to see our newest exhibit—Portraits of Global Caring. It features inspirational journalism and over 100 drawings by kids from around the world.